The characteristics of the local piezoelectric response of isotropic films of copolymers of vinylidene fluoride (VDF) were compared with 6 and 29 mol% tetrafluoroethylene (TFE) obtained by crystallization from a solution in acetone. Time dependence of the electric displacement response was analyzed after switching of the spontaneous polarization. A copolymer with a higher content of tetrafluoroethylene is characterized by higher values of electrical displacement and piezoelectric response. For interpretation of this fact, we used molecular mobility in amorphous phase dates. It is shown that the activation energy of local and cooperative liquid-like (in the amorphous phase) mobility is markedly lower in the copolymer with a higher content of TFE. 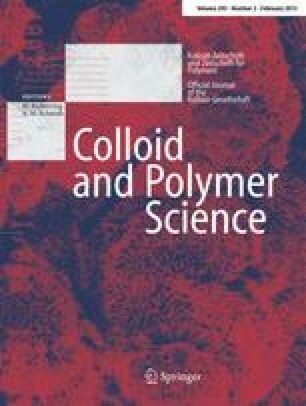 Under identical conditions of the crystallization, both films of the copolymers lead to the formation of larger crystals of the polar phase and magnitude of a “long” period at a high content of copolymer of TFE. It is postulated that these structural parameters are responsible for the stable value of residual local piezoelectric activity. It is found that the rapid decay of the signal in the local piezoresponse of polarized films is controlled by the activation energy of the local and cooperative dynamics chains of the amorphous phase. The work was carried out with financial support in part from the Ministry of Education and Science of the Russian Federation in the framework of Increase Competitiveness Program of MISiS, RFBR research project no. 14-03-00623 A. The studies are performed on the equipment at the “Materials Science and Metallurgy” Shared Facilities Center of the National University of Science and Technology “MISiS” (ID project RFMEFI59414X0007, contract no. 14.594.21.0007).